I am not going to lie to you, running a non profit for your child is not easy. Trying to balance everyday life with running like mad to make a difference in this disease is hard. I would say the first five years of JOA’s existence was pure panic. I think in that panic, we created some really awesome fundraising moments and movements. We are so grateful for the grassroots fire that started in JOA in those years of panic. I think without the overwhelming support, we as a fighting family could have crumbled. ​​The last five years we found our way, what worked, what didn’t and have settled into a handful of really good fundraising events. Of course our best is the Picnic in the Park. It is similar to planning a wedding every year, and the generous support from our community is outright awesome! Together, we have put over ½ Million dollars into the hands of real science working to derail this beast. For that we are so, so humbled and grateful. ​But again, I won’t lie to you. We are heading into our 12th year of events, all focused on Family and Fellowship. I, though, am having a hard time feeling relevant. It is hard to keep the events fresh and exciting. So, we ask you, is there anything at our events that you’d ‘wish’ were there? We are so open to new sets of eyes and ideas to help us further derail Duchenne! Email me jen@joainc.org with your helping hands and ideas! We are thrilled to bring Nerf Battle to North Royalton on March 30 from 1pm to 330 pm at North Royalton Field House. We are so grateful for the Schultz Family as they help us Host this great event. This event is open to all ages and is a great way to get the cabin fever out! Click here to register for $10 fee. 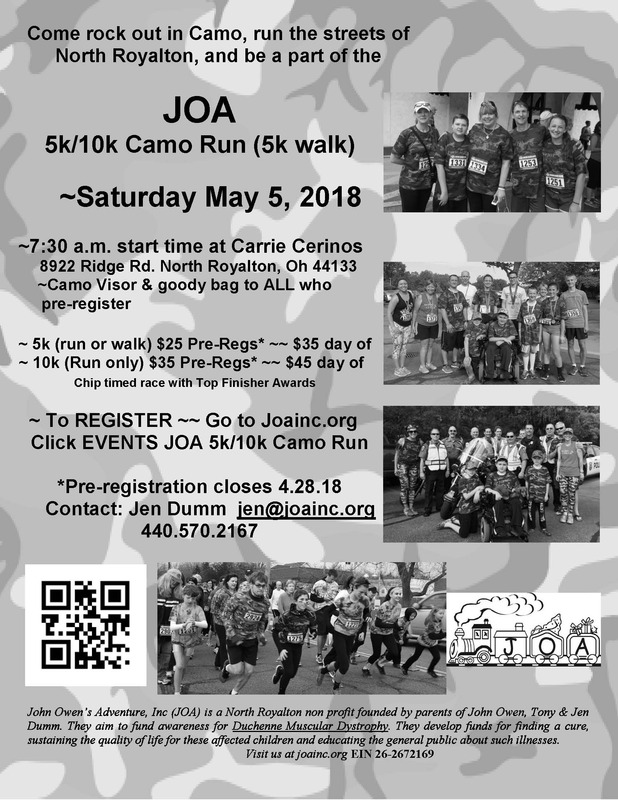 Our Camo Run that once filled the streets of North Royalton is a bit smaller each year, so we (with the Kilbane Family) will host the Camo Run Lite again this year at Bonnie Park on April 13 ~ 5k Run or Walk and donations in lieu of a registration fee. Please join us, click and help keep this event relevant! Elsa and I will tackle the Rite Aid Half Marathon on May 19! If you’d like to join us in this Moving Spirit Adventure, please email me at jen@joainc.org. 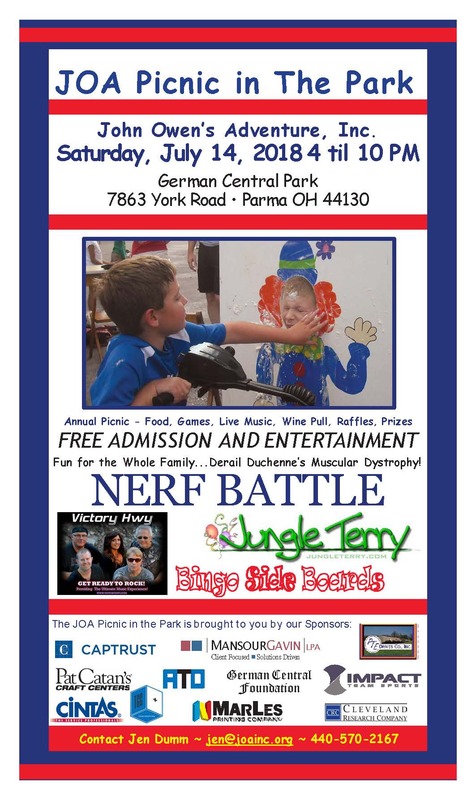 And drum roll please…….. July 13 is our awesome Picnic in the Park brought to you by our beautiful sponsors and the generosity of our community donating product, gift cards, sporting event tickets and money to make this a great summer night celebrating to derail duchenne. We’d love ideas and hands to improve this event. We started our picnic when Owen was four years old and have catered to the younger crowd. Well now, they have all grown up and we are looking for ways to incorporate 12 to 16 year olds in the event. Even better, would be volunteers to help run that idea  of course we will still have the great kids games, Jungle Terry, live music, tons of raffles, great food and German Central spirits! And a very special Thank you to the Frangulea Family, Mun Mun and Opa and Marles Printing who made our Spring Mailer possible – look for it via snail mail and share with friends and family! The Boys are doing awesome! Rutger continues his job at ACE and is rocking out eleventh grade at NORO. We can’t believe how fast this kid grew up, before we know it he will be an adult! Ugh! Owen has really settled into ninth grade at NORO. Though we say every night, 5:45 am comes fast – other than the drastic early rising – he is doing awesome. Great grades and he is even participating in a few social clubs. He continues with his weekly infusion of Exondys 51 (God send) and we continue to praise his stable health. Wade is rounding out sixth grade with excellent grades and is pretty much always reading. 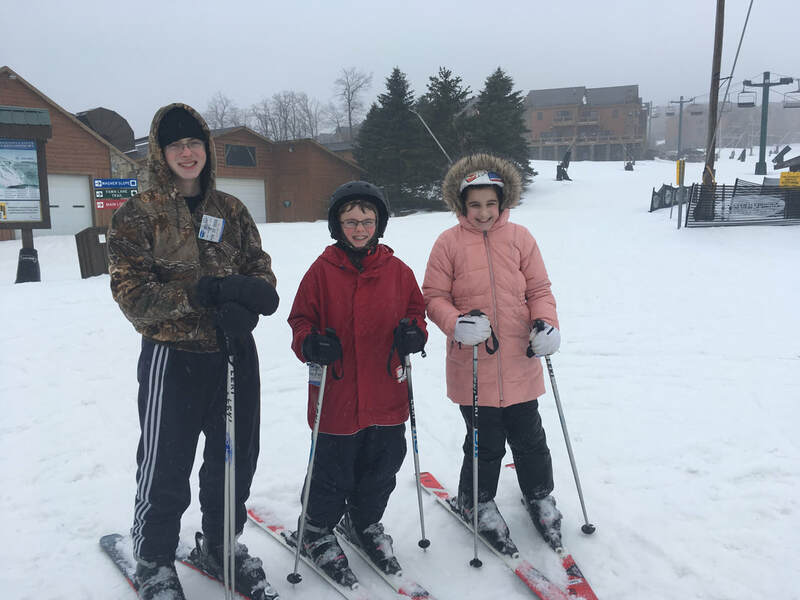 He did have a great ski club season and we even got out to PA on a quick ski trip to visit our friends the Tomkovicz’s that moved last year. Tony and I continue to be amazed at how fast the weeks fly by. Hoping to keep these boys young and at home as long as possible. We are blessed, truly truly blessed in so many ways! We hope to see you this year ~ please be sure to say hi and give hugs!! So many days just fly by now that the boys are older and they, for the most part, don’t need us as they did when they were toddlers. Teenage years, though precious, are certainly not filled with the clingy, sticky hands that our days were once filled with. But it is all good. Right? Can’t stop them from growing despite our urging. Rutger is now 16 and driving. He is taking college classes at Tri-C this summer, volunteers 3 days a week and is searching for a job – all things that take him daily away from our protective arms. But its all good. Owen is off to High School in August and though we all desperately want him ‘not’ to need us every day – physically of course he does – but certainly emotionally he is so done with being a kid and ready for independence. Gosh, how I so wish we could fully give that to him. But we try as much as we can! Its all good! Wade – though 11 and being the youngest, seems more like 16 as well. His nose is constantly in a book, when of course, he’s not being Owen’s hands and feet this summer. He is growing like a weed and ready for sixth grade at St. Al next year. We really never thought the day would come when we only had one kid at St. Al. Oh goodness, stop with the growing. Larry – well yes he is still awesome. And Yes he still serves by Owen’s side with every breath. I can’t believe how this dog is so attached to Owen’s side. Today we celebrate our Independence, 228 years of it! Seems like a far cry from our boys, Right? Seeking and grabbing their independence from us in just a few short years. It’s all good. Nothing will stop time and nothing can replace the great memories of our boys growing up. We are so grateful to be free and to live in this amazing country. All that have sacrificed for our very freedoms to type this and share publicly. To start a non-profit and raise funds for research for Duchenne, to work hard, raise a family and provide so many things that most of us take for granted (food, shelter, healthcare). 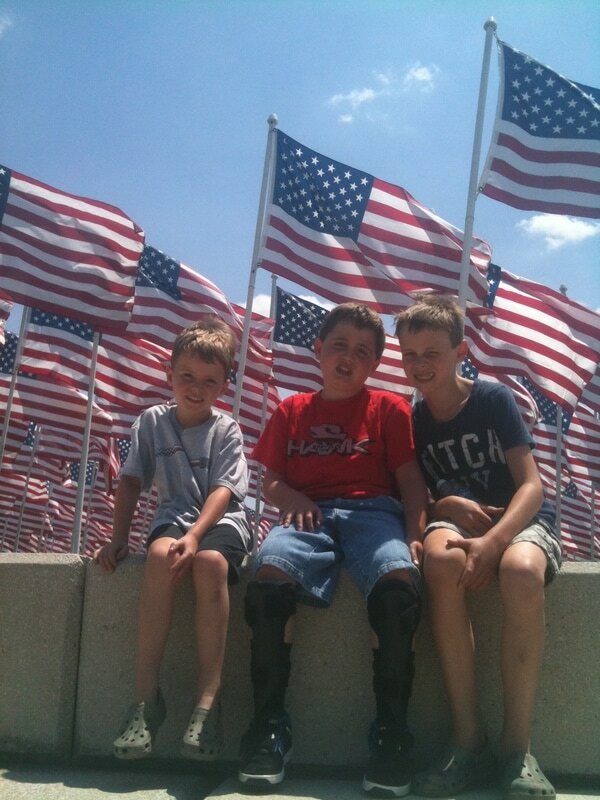 We want to say Thank you to all that made and make our freedoms possible. What a blessing it is to be Chilin with the boys in the land of the free! We hope you can join us in 10 days to celebrate our Picnic in the Park on 7.14.18 from 4pm to 10pm. As always we have an amazing line up - Live Music, Great Food, Kids Games, Adult stuff and amazing raffles. Please be sure to stop us to give hugs and hellos as we are so very grateful for each of you that continue to lift us up while together we #derailduchenne! I know we are fighting the good fight, but at times, you know, it just stinks…..
We can make that happen, you can make that happen. Keep this going and keep the giving coming! 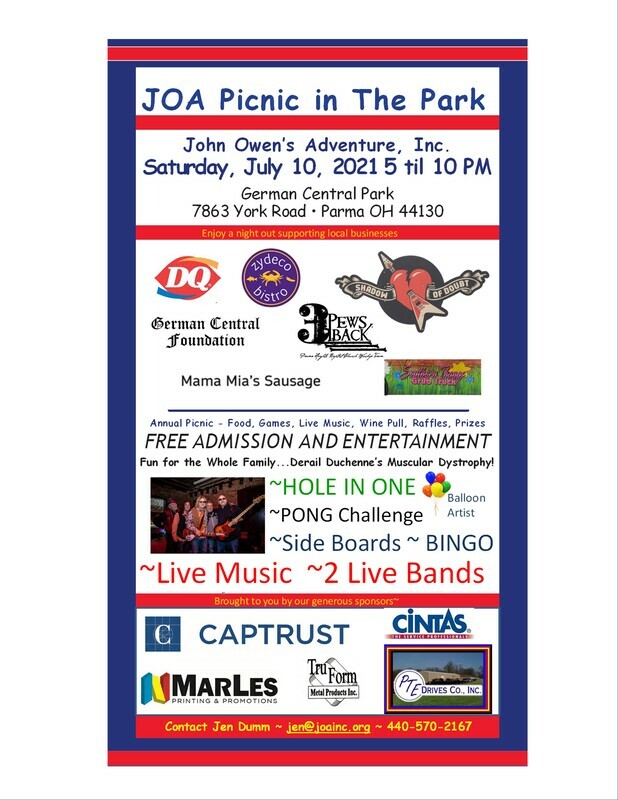 Invite your Friends, Family, Co-Workers to our Picnic in the Park on 7.8.17 – you die hards out there know this is an incredible Family centered AFFORDABLE event…. Coupled with our tried and true great kid’s games, raffles, GERMAN BEER, amazing FOOD (all about the food) and Victory Highway to keep you dancing! The handcrafted raffle items are amazing again this year as well, the basket raffles are shaping up to be STELLAR!!! Disney tickets, Airline Tickets, Tv, Furniture, Artwork, gift cards…. Oh so excited! A GIANT Thank you to our beautiful Grandma Barb Muniak for her relentless work in soliciting so many amazing raffle items!!! Love love you!! Oh goodness and do you know our Volunteers? The MOST dedicated in Northeast OHIO!! Sign up guys for your station as we so treasure your service and we so need you on 7.8.17!! For those that need a checklist to keep you motivated and focused…. Here you GO Baby! Derail sweet thing!!! Derail……. So for the rest of our life….. 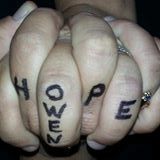 It has been an insane year with Owen’s surgery in September and his recovery. Thanking God that we are still in the Eteplirsen Study so he continues to gain strength as he continues to still recover from spine surgery. Loving on the Sunshine and that the Boys will be off school in a few days! Rutger flew through his first year of High School and despite our urging to stop – he keeps growing! Wade is doing swimmingly in school as well and all three are just ready to do nothing but Chill, enjoy the treehouse, Larry and life. Happy Father’s Day to all of our amazing Dads! And please, keep doing what you do best, pray for our Duchenne boys and support our biggest event of the year!! A word I’ve never considered to be part of our Duchenne world. Joyfully, we all know and embraced a survivor. Whether from a brutal illness or a strong warrior finally coming home. The St. Jude Commercials (love) tears me up that 1 of 5 children with cancer will not survive. 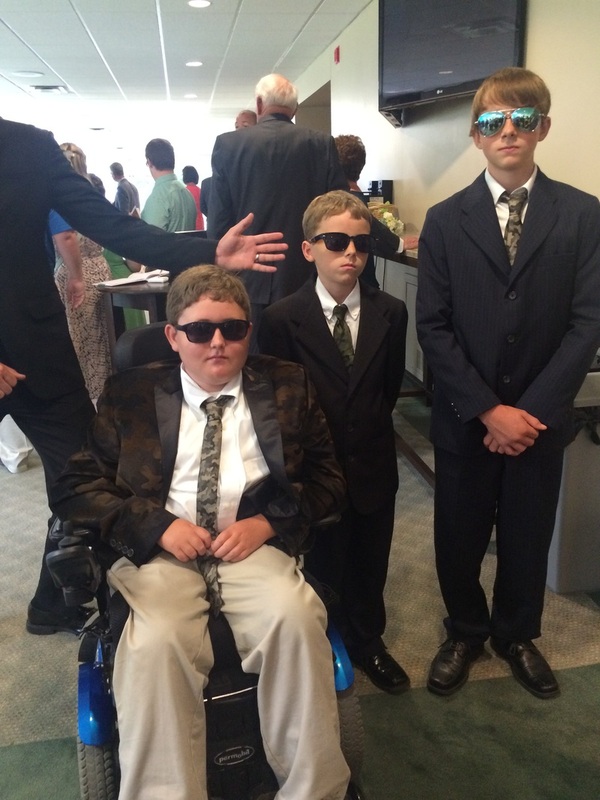 In the Duchenne world, 5 of 5 children with Duchenne will not survive. Since our diagnosis, day one, has never been about survival. This year we had the honor of raising gobs of money for Duchenne Research through our various events, our biggest event, the Picnic in the Park. Our spot on Board of Directors approved the disbursements of these funds to PPMD to fund CRISPR(Cas9). This research is more than medicine, it is technology. I finally found an hour to listen, really listen to this webinar hosted by PPMD in December. Listening to Dr. Olsen, it was difficult not to weep. 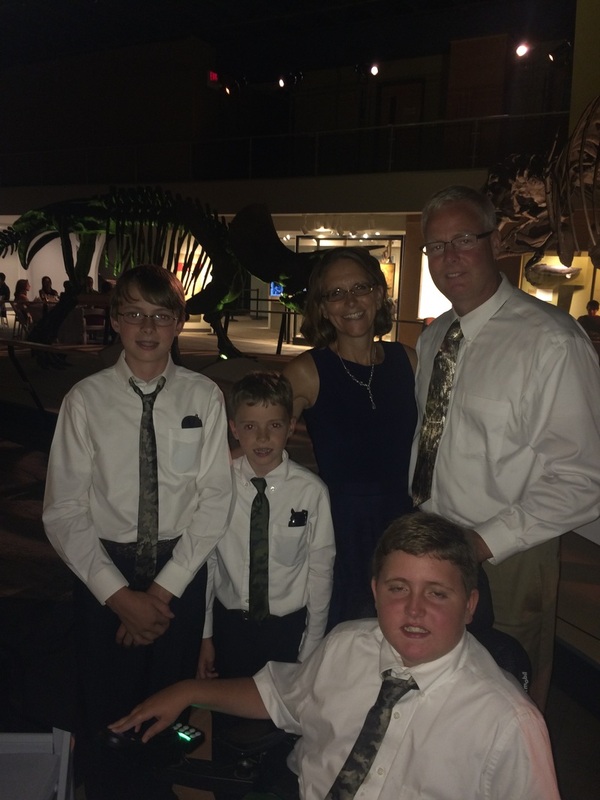 As always, these education pieces relive our journey – from day one diagnosis to the future plans Duchenne has for Owen and his sweet young body. It is always painful to listen to our Duchenne reality. I let this technology soak in throughout the day and as I drove home that night, I heard in my head, over and over……. Praise God that perhaps in Owen’s lifetime and all our current and future generations, we can know and embrace a Duchenne Survivor. Please support our efforts in 2017, we have several family friendly events to help us constantly fund the path to finally derail Duchenne. Please read the PPMD News release from today, helping us all understand this amazing pathway to surviving duchenne. Last 2016 JOA Event, Catch our Spirit! So excited that we can celebrate this awesome year with our last event, our Moving Spirit 2016 Team Half Marathon and Marathon. We get to celebrate the approval of Eteplirsen by the FDA in the very city Eteplirsen was first dosed in the original 12 boys, Columbus, Ohio at Children’s Nationwide in the very race sponsored by Children’s Nationwide! Kathy Warner, Diane Eichman, Peg Sonday and James Harrison will rock out the Full Marathon on 10.16.16! Deb & Ronan Factora, Jack Reardon, Julie Reardon, Sally Kapcar, Christie Kinney, Carrie Valdez, Elsa Klibane and I will run the Half! If you recall this team has run many, many miles for Duchenne. From Fulls to Halfs to 10k and 5k all steps to stop this beast of a muscle killer. On Sunday 10.16.16 we will run 222.70 miles. Please say a strong prayer Sunday morning that we make it through these many miles with safety, courage and joy in our steps. Consider please donating this week to our team. It’s almost an out of body experience to listen to one of your kid’s friends share his thoughts about your son and their friendship. Last night, I stood in for Owen at the St. Joseph & John / St. Albert 7th grade football meeting. This team is a joint football team between the schools of 12 and 13 year old boys. Half of these players are Owen’s classmates, we have been together since Kindergarten (some even pre-school). We’ve been blessed by these families with their generous support for JOA and even more, their heartfelt love for Owen and our family. Owen was inducted into this football team last night as the 24th player and each player will wear Owen’s name on their helmet all season. This started from the pure friendship from Owen’s friend John. The day of Owen’s spine surgery, John was really upset at practice and asked his coach and teammates to pray for him. From that, the spirit of Owen on the team came alive. 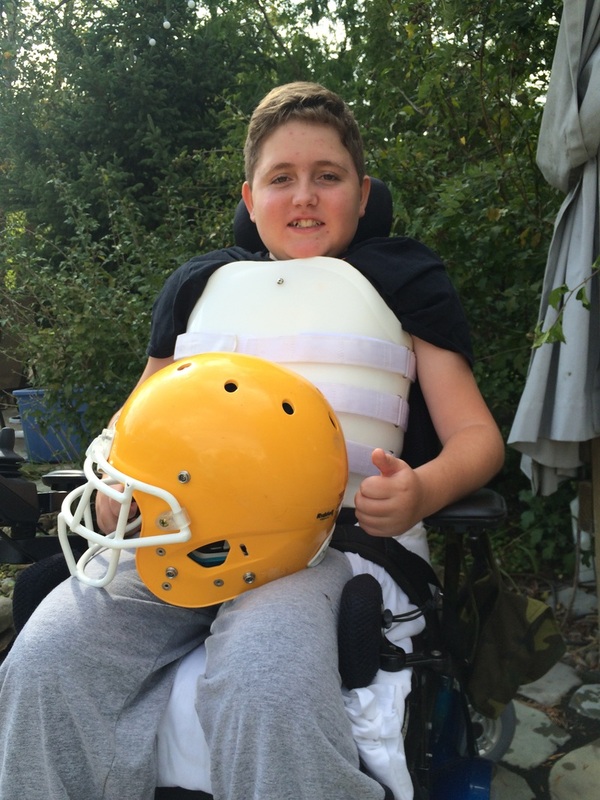 They asked Owen to come last night to receive his team helmet and jersey and talk with the team about Duchenne. Since he was not up for it physically, I gladly took the challenge. After my short talk about Duchenne and mainly special needs kids, his friend, John gave an amazing testimony about his friendship with Owen. It was one of those times that though I did not record his talk, I will forever replay his very mature, kind and heartfelt words over and over. John said Owen was one of the best friends he’s ever had. Not many special needs kids have friends, let alone, one’s that call them their ‘best friend’ (tears). He shared the qualities about Owen with his teammates, words that will forever make me proud as a mom, knowing he is a good, kind child to others. Then John shared how he felt the day Owen had surgery….. my heart stopped for a beat hearing these words…. He said, “the day of his surgery I was really scared because Owen wasn’t in school, he was just GONE.” At that point John (and me) got very teary eyed and I felt what he was feeling…. As if to say what if he is “GONE” and not coming back…. (Curse you Duchenne for filling our hearts with fear and worry … Curse you Duchenne for stomping all over our childhood….) Oh this sweet child, in front of his peers, so willing to cry for the fears of his friend and this dreadful beast of a disease. I so wish everyone could see this view, a buck just strolled by (don’t tell the boys), gentle summer breeze, tree frogs and crickets chirping. It’s been a wind down month since the Picnic in the Park on 7.9.16. We were able to enjoy a week in PA at the family cabin, pool time, swim Tuesdays, bonfires, grilling and yes, the Tree House. We are still in awe at this majestic structure that Owen wished for and it has come true. Rumor has it that it is over 1,200 square feet. It’s not that big, but certainly bigger than most New York City apartments. It is so humbling the amount of generous spirits there are in the world. If you ever doubt the human spirit, just come sit here and see the view from the Tree House. None of it possible without all the donations of those supporting Make a Wish. We are rounding completion of the interior and hope to showcase it by September. We can’t wait for the boys and their friends to have their first camp out! Come share this view from the tree house, anytime!!!! 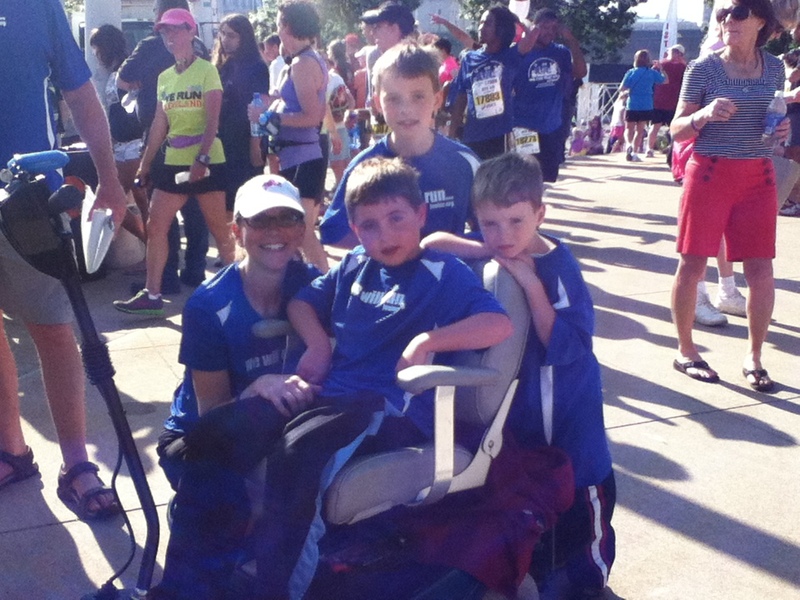 We moved our running team to the Nationwide Children’s Columbus Marathon / Half Marathon. 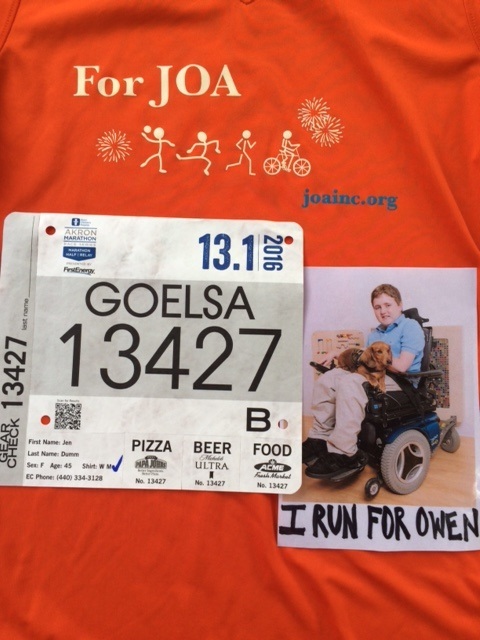 As you know, Owen’s trial is hosted at Nationwide Children’s Hospital in Columbus, so why not run in support of this amazing place? It is not too late to join our running (and walking) team. The marathon is 10.16.16 and promises to be FLAT!!! (Yea, no hills!). If you are interested check out the Moving Spirit page or email jen@joainc.org. We will train you – you can do this!!! So excited for the 17th Annual JDRF Scavenger Hunt on Saturday August 13, 2016, scavenger hunt from 1:00-4:00 PM in Put in Bay!!!! Check it out by clicking here, come join us for an awesome day on the Island for an amazing cause!!! Join us for a great night hosted by Mindy and Doug Lee at their Rhizo Kids Fundraiser Rhizo Kids Need a Hero Night at the Races!! I will be running the 7/11 table and need your support for this amazing family. I hope to see you there, click here for more info. Love to be part of a reverse raffle and amazing date night? Join Braedan’s Bridge, our good friends Tammy and Scott Henegar at the Tam O Shanter center in Sylvania OH for an awesome night! Please click and share these details! This was an amazing night! The weather was spectacular and the crowd HUGE! We so appreciate all the folks that always make this event happen, the countless volunteer hours and all the support from each one of you to support the event by presence and pocket. Save the date for 2017 as we will be hosting our 10th year – it is impossible to believe we have been on this journey for ten years. 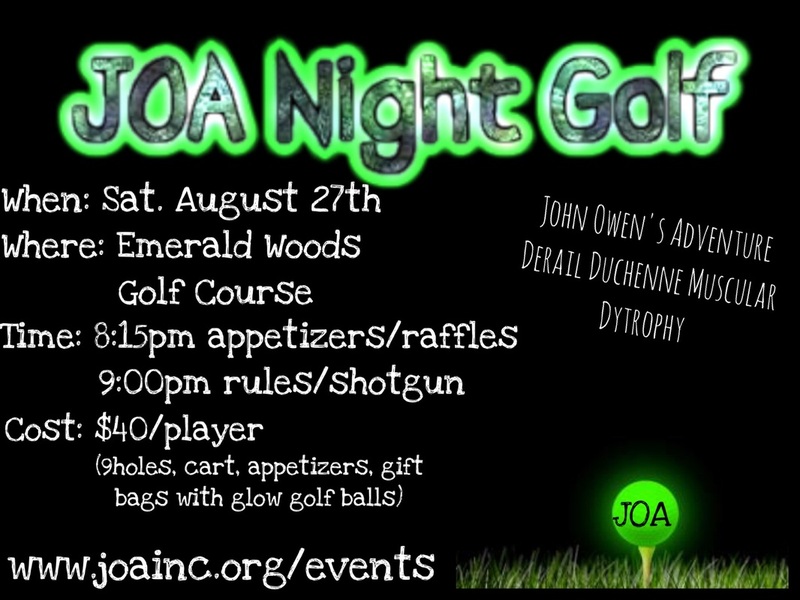 July 8, 2017 – don’t go planning any graduation parties, vacations or weddings – plan to be present at JOA 7.8.17!!! We need ideas to help make this EPIC so please share any advice in making our event the show stopper ten year event! So grateful for the legs and hits on the Lumberjack 13U 12U and 11U Travel Baseball teams!!! Every single base made this season added up to $$$$ for Duchenne Research! Together the teams raised over $2,700 towards research! What’s up with the boys? So Rutger will be heading to High School in a few weeks, we know these four years will disappear and he will be off to college before we know it…. Soak it in … soak it in…..
Wade will be heading into fourth grade at St. Albert the Great…. Trying to prepare for the work load, fourth grade is tough, but he can do it!!! Owen will be heading into seventh grade at St. Albert the Great. He continues to do amazingly well with the trial, small improvements and sustaining in areas we thought he would certainly not. Sadly, we have ZERO news on the FDA decision to approve Eteplirsen. April feels like years ago, and still mum is the word out of DC on when they will stop screwing around and start changing the lives of all our boys. Thank you again for your unending love and support as we constantly pray to derail Duchenne.